Our very first Rotary Club President Terry Giles, who is also the guest speaker, and Paul Carson, guest of President Linda Porritt. Dave Andrews - Reverse Draw Tickets - Let’s Get Selling!!!!! Let’s get Silent Auction items (be sure to send a photo, retail value, donor name address, etc to Dave Andrews so he can create a poster for the evening and also for Facebook and our website. Your donors will appreciate the promo). When Ted Morrison returns on April 9, please bring the Silent Auction items to him. February 26 is one of many Committee Meetings at 8:00 pm. On March 19, members of the Reverse Draw Committee will be going over more details and if you have any questions, this will be an excellent opportunity to get them answered, to help you sell tickets and get silent auction items. Lennis Trotter – The next meeting of the Kids’ Safety Village will be held on Mar 18 at 5:30 pm at the Village to discuss upcoming plans for Easter and other events, including Whitby Doors Open to be held May 4. Sue MacKinnon – The March 9 Bingo will need one more volunteer. Also, Sue will be absent April 13 and will need another volunteer to replace her for that Saturday night session. Janice Coupland – St. Paddy’s Day will be celebrated on Tuesday, March 12 at 6 pm at Finn McCools, beside Costco at 214 Ritson Rd N, Oshawa, ON L1G 0B2. NO MEETING AT THE OSHAWA GOLF CLUB. Janice Coupland - Reminder of the Oshawa Generals game on March 17 at 6 pm at the Tribute Community Centre, Oshawa Generals Hockey vs Sudbury Wolves. The tickets to the private box are free but food is $25 per person. Janice Coupland - The revised date for the fashion show is now Sunday, Sept. 15 2019. President Linda Porritt – The cost for theDistrict 7070 Conference on Oct 25-27 held in Muskoka on Lake Rosseau, is $299 until Friday, March 15, then jumps up to $349. Rates for the Marriot are $135/night. See more details below. Pres Linda - MAR 24 - District 7070 Curling Bonspiel – Oshawa Golf and Curling Club – 9:00 am to 2:00 pm - truly a “funspiel” – we’re looking at a great day with Rotarians & family & friends. You don’t need to be an expert…though you may want to have at least stepped on the ice and practiced beforehand! Registration is by team so get your foursome together. Don’t have a team? Well rustle up your fellow Club members. Perhaps we can convince Bob Elliott to put a team together (Rotarians and friends). If you’re keen to curl and can’t find a team, send DG Neil your position and he’ll see if he can hook you up.feature a warming coffee to get you started, then two six-end games. After the first draw, we’ll determine second game draw playoffs based on standings. Lunch is included – served between first and second draw (11:30 ish) let us know if a vegetarian or special meal is needed. And of course…there may be some prizes for the top team(s)! Cost is $50 per person, registered as $200 per team. . We hope to see you there! Pres Linda – March 31 is the deadline for applications to RYLA (Rotary Youth Leadership Awards) – taking place , this year . Maximum number is 40 Youth Participants. Dates: May 3 to May 9, 2019 at the YMCA Cedar Glen Outdoors Centre. Cost is $950 and our club will pay the cost. The Rotary Youth Leadership Awards (RYLA) program of Rotary District 7070 gathers youth ranging from ages 19 to 25 for an immersive program focused on diversity, leadership, and action. Here is a link to the details. We're excited to share the news about the 2019 Rotary Youth Leadership Awards that will be taking place from May 3rd to May 9th, incorporating the Rotaract District Conference! See link here for more and/or sponsoring you, please refer to the image attached. The application for participants is due on March 31, 2019 at 11:59PM EST. Good luck to all nominees! Look at the info on this page and the links and then , please contact our Rotary Club director of Service, Kim Boatman at kboatman@oshawaexpress.ca . Pres Linda – May 31 is the deadline for applications for Rotary Peace Fellowships. Each year, Rotary awards up to 100 fully funded fellowships for dedicated leaders from around the world to study at one of our peace centers. Through academic training, practice, and global networking opportunities, the Rotary Peace Centers program develops the fellows into experienced and effective catalysts for peace. The fellowships cover tuition and fees, room and board, round-trip transportation, and all internship and field-study expenses. Here is the link. Each year, The Rotary Foundation awards up to 50 fellowships for master’s degrees and 50 for certificate studies at premier universities. Master’s degree programs: Accepted candidates study peace and development issues with research-informed teaching and a diverse student body. The program lasts 15 to 24 months and includes a 2-3 month field study, which participants design themselves. Professional development certificate program: Experienced leaders gain practical tools for promoting peace and international development during an intensive, 3- month program, which includes 3 weeks of field study and peer learning opportunities with a diverse group. 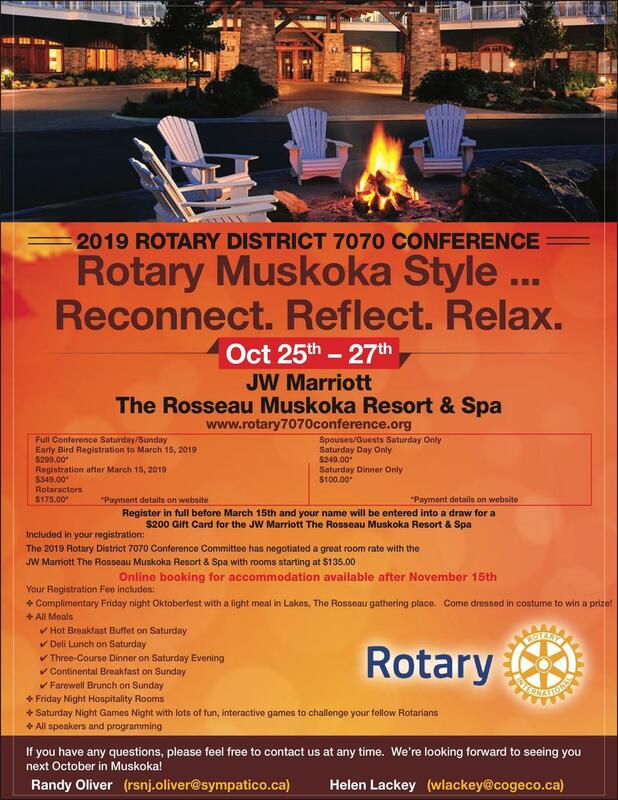 VP Lennis – District 7070 Conference is Oct 25-27, at the JW Marriott Rosseau Muskoka Resort and Spa. REGISTER FOR THE CONFERENCE BEFORE March 15 and save $50 per person. And be sure to BOOK YOU ROOM - A very special room rate of $135 per night but they are going fast. This rate is good for the entire week. VP Lennis - District Training Assembly, April 13 at BMO Institute For Learning (IFL), 3550 Pharmacy Avenue, Scarborough, Ontario M1W 3Z3 8:00 a.m. - 2:00 p.m. Lennis Trotter has asked all of the Board Members and Committee chairs for next Rotary year to attend and sign up on the District 7070 website. Open to all Rotary Club members . Our Rotary Club will pay for your registration cost. Registration open soon. PDG Ted – MAY 4, 2019 - Kids Against Hunger Meal Packing Day – Tentative Location Jubilee Pavilion at Lakeview Park. Alternate Location: The Onion at Durham College - gather your spouse, children and grandchildren too (over 8 years of age) and come out and help pack thousands of meals . Joint project with the 2 Rotary Clubs of Oshawa and our two Rotary Clubs in Whitby. Start time at 8:30 am BBQ to follow. We need lots of hands on help from you, your family and friends. Pres Ted will pass around a SIGN UP sheet . Please let him know if you can attend. What a great time to bring out a prospective member to see how we really are People of Action. Sgt Tim Dwyre conducted our Draw tonight. Thank you, Tim. Winner: Sue MacKinnon Card Drawn: 8 of Hearts … the deck of Cards get smaller. Dan – Happy to see the latest acquaintance here tonight, guest Paul Carson. Larry Hurren – He’s been away in Costa Rica and would recommend this as a warmth and friendly country. When he returned, he was taken to task, babysitting his grandchildren, ages 5 and 7. Linda – Chided Robert Kipling who spoke last week about attending the Prospectors & Developers Association of Canada: The World’s Premier Mineral Exploration & Mining Convention at the Metro Toronto Convention Centre, with over 1,000 exhibitors, 3,500 investors and 25,600 attendees from 135 countries and guest speaker Prime Minister Justin Trudeau, who would also be speaking at another meeting tonight. Sue – Gave a Happy $5. Her co-worker explained to her that breaking glass (which she recently did) was a sign of bad luck ending and good luck beginning. So the co-worker was on to something as Sue won the draw and received the toothpaste. Janice – Kris and Janice had a good time in Florida. It was reported there would be iffy weather but the entire week was in the high 80’s. They did many activities, including taking a boat cruise, shopping, visiting the beach and more. Founding Oshawa-Parkwood Club Rotarian Terry Giles. Terry, the 1st Rotary Club of Oshawa-Parkwood president in 1976, spoke about his youth and his time in the war years. In 1944, Terry quit the boarding school he attended in England and applied to join the Royal Naval College. Since the Navy was all about who you knew in order to get in, he met a friend and went to Liverpool to hop aboard a Merchant Ship called the M.V. La Pampa. He told his mother he had joined a ship and would return in about 6 weeks. It turned out that he was gone for 17 months. While he was on his way to Brazil the war had ended. From Brazil, they sailed to Singapore, then went back through the Suez Canal, on to America (Boston and New York), before returning to Singapore. They went back to America again, south, and on to England where he disembarked. Then he got a letter saying he got into the Navy. He told them he wasn’t interested because he had just finished sailing around the world. But they said he had to go, where he became a medical attendant. Since his father was a builder and in construction, the Navy put him to work laying patio stones, where he served 4 months. That was the end of his Naval career. He later met his wife Jean and they came to Canada in 1952 where he settled in Scarborough and got a job at AP Taylor. He studied engineering at night school (Ryerson) for three years and was hired in the city of Oshawa where he became Chief Building Inspector, and retired after 27 years. He also moved to Oshawa where he and his wife raised two daughters. He now has two granddaughters and one great grandson. Terry will be 90 on May 2. He is also the author of books and wrote a poetry column called Poet’s Corner for one year for the Sunday Sun. Just enough charity to astound. REMINDER – REGISTER FOR THE 2019 DISTRICT CONFERENCE AND BOOK YOUR ROOM. SEE YOU THERE.